I love making music with kids aged 3-6, especially pairing music with early literacy learning, which is a natural fit. I once taught at a preschool where the director told me: “Just have fun singing with the kids,” implying that they’d pick up the literacy learning elsewhere in their day. I understand what she meant, but she missed the point. Childhood music and early literacy are so intertwined that it’s hard to make music with young children without touching upon key literacy skills. Consider the topic of rhythm. Rhythm is a part of language, just as it’s part of music. Many music teachers incorporate syllable segmentation into their lessons by having students clap their names or tap words on a drum. Musical rhythm becomes interchangeable with language rhythm. Just as they segment musical phrases, children hear and understand multi-syllable words in chunks that can be sounded out and broken into smaller elements. Or consider another activity we often do with young children: saying a familiar rhyme and letting the child fill in a rhyming end word. For example: Patty cake, patty cake, baker’s man. Bake me a cake as fast as you ___ (the child fills in can). Songs and nursery rhymes are a natural vehicle for children to hear, express and initiate rhyming words, thus distinguishing vowel sounds and building phonological awareness. Finger plays also build manual dexterity as children work toward handwriting skills. Here’s a link to a recording of this song, although you should note that I usually sing about all the fingers in this song: Tommy Thumb, Penny Pointer, Toby Tall, Ruby Ring and Pinky Finger. 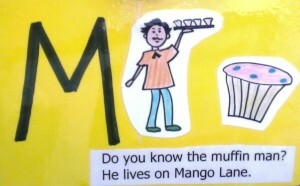 My version of “The Muffin Man” engages children with starting letter sounds in verses about “Muffin Man,” the “Lemonade Lady,” the “Cookie Cat” and the “Donut Dog,” to name a few. I add visuals by using a sign with key words and a picture for each verse. “Icky Sticky and Ooey Gooey” gives students a chance to hear and guess rhymes by connecting a word to a rhyming body part (sand-hand, tree-knee, hoe-toe, track-back). I use spoon puppets to engage children visually and create a sense of fun. Movement activities, always part of my music lessons, have many literacy links. When children imitate caterpillars and butterflies on my song “If I Were a Butterfly,” they build their understanding of a sequenced nonfiction narrative. If they act out my musical version of “The Tortoise and the Hare” to learn about tempo, they’re getting a taste of the fable genre and building understanding that all stories have a beginning, middle and end. They might develop a similar understanding by acting out my “Three Little Pigs” song, described in another post on this blog. I love language, stories and poems, so to me, the literacy element has special appeal in music lesson planning. Musical concepts on their own, even for young children, can be somewhat abstract. Literacy content grounds the music lesson in the familiar world. At a workshop with Andy Davis of New England Dancing Masters, he talked about telling stories to introduce new songs to young children. He understands the connection that children naturally make with a good storyteller or a book, which often can lead into a song. The reverse is also true. 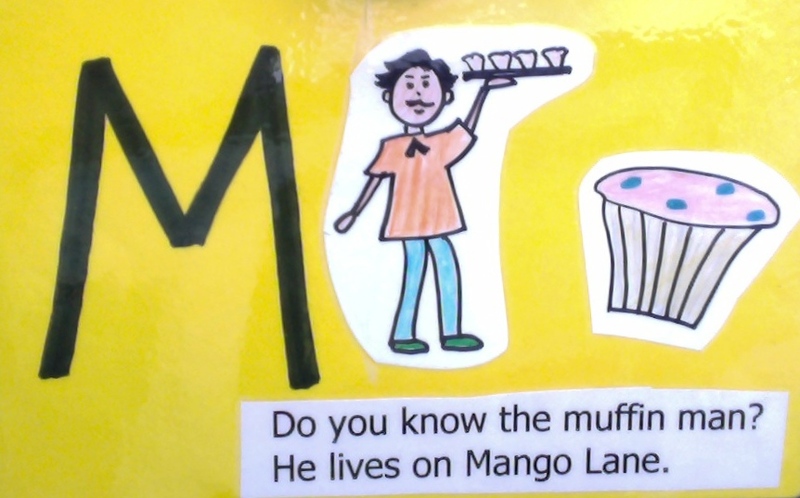 A song can get children’s attention on a literacy topic. 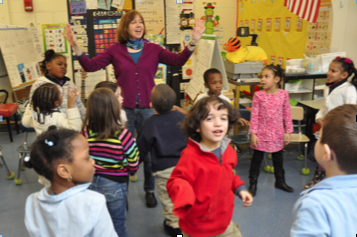 A teacher can begin a lesson on rhyming words having the children join in singing a rhyming song. My songs on word families, sound segmentation and syllable clapping are a natural lead-in to spoken lessons on those topics, especially once the kids know the songs and can sing along and even help compose their own verses. You can find most of the literacy songs I’ve mentioned on my download album, Songs for Rhyming and Reading. My first love in teaching is music, but I firmly believe in all the connections that music can make to everything else in a child’s world. The connection with emergent reading is a total natural! Previous Previous post: Don’t Forget the Music! 6 Back to School Tips for Teachers!